Danville, Calif. (March 22, 2016) – Trumark Companies, a diversified real estate developer and builder, has added two seasoned controllers to its operating companies – Trumark Homes and Trumark Urban. Laurie Byer joins the Danville office of Trumark Homes while Franziska Frey is stationed in Trumark Urban’s San Francisco office. The two will oversee all aspects of financial management including corporate accounting, regulatory and financial reporting, budget and forecast preparation, as well as the development of internal control policies and procedures. Trumark Companies, a diversified real estate developer and builder, has added two seasoned controllers to its operating companies – Trumark Homes and Trumark Urban. Laurie Byer joins the Danville office of Trumark Homes while Franziska Frey is stationed in Trumark Urban’s San Francisco office. The two will oversee all aspects of financial management including corporate accounting, regulatory and financial reporting, budget and forecast preparation, as well as the development of internal control policies and procedures. Laurie Byer has more than 30 years’ experience in the homebuilding and construction industry with an emphasis in strategic planning, financial planning and analysis. Ms. Byer has held positions with both private and public companies in Illinois, Minnesota, Arizona and California, including Lennar, John Laing Homes, Signature Homes and most recently, served as Chief Financial Officer of Industrial Electrical Company in Modesto, Calif. She received a Master of Business Administration degree from Roosevelt University in Chicago and a Bachelor of Science degree in Accounting from Elmhurst College. Franziska Frey is a seasoned accounting and finance professional with particular expertise in process and policy development, full-cycle accounting, data analysis and communications. Prior to joining Trumark, Ms. Frey held several roles during her ten years with the Bridge Housing Corporation, California’s leading non-profit affordable housing developer, most recently serving as an Accounting Manager – Development. She obtained a Master of Business Administration degree from University of California, Davis and a Bachelor of Arts in International Relations from University of the Pacific. This news comes on the heels of Trumark Homes announcing the acquisition of Fielding, a neighborhood subdivision within the Wallis Ranch master planned community under construction in Dublin, Calif. owned by sister company Trumark Communities. Trumark Urban also has several luxury residential projects underway in California, including TEN50, a boutique high-rise residential tower in downtown Los Angeles where sales will commence in April and The Pacific, a collection of 10 row homes and 66 jewel box residences in San Francisco’s prestigious Pacific Heights neighborhood. Trumark Homes has announced plans to develop a neighborhood in the anticipated Wallis Ranch development, a master-planned community in Dublin, Calif.
Acquired in collaboration with real estate investment firm GTIS Partners, the neighborhood, called “Fielding”, will include 139 two-story, single-family homes ranging in size from 1,809 square feet to 2,686 square feet. The units are slated to hit the market in the second quarter of 2016. Nationally award-winning California homebuilder Trumark Homes and global real estate investment firm GTIS Partners have acquired one neighborhood subdivision within Wallis Ranch, the highly-anticipated master planned development under construction in Dublin, CA. The neighborhood “Fielding” will include 139 two-story single-family homes ranging in size from 1,809 square feet to 2,686 square feet. Construction is underway with sales slated to begin in Q2 2016. The overall 184-acre Wallis Ranch master planned development was acquired by sister company Trumark Communities in 2014 through a partnership with Isles Ranch Partners, LLC and Castlelake, L.P. Upon full buildout, Wallis Ranch will deliver more than 800 new homes within eight neighborhoods to a region that has seen a significant boost in housing demand as a result of the thriving San Francisco Bay market located less than 40 miles away. The master plan features single-family detached homes and townhomes designed by local architecture firms KTGY (Oakland) and Dahlin Group Architects (Pleasanton). To create a tranquil enclave that appeals to buyers’ active lifestyles, Trumark Communities dedicated over half of the master plan’s acreage to parks, open space and a water-quality basin. Landscape architects Gates Associates will bring to life a three-acre common area featuring an edible garden, fitness center, pool, spa and BBQ area surrounded by a mile of trail systems. Trumark continues to be a leader in innovation within the industry and with the California drought top of mind, the company will incorporate drought tolerant landscaping that will use all reclaimed water throughout the master plan. Trumark Homes and GTIS Partners have acquired one neighborhood subdivision within Wallis Ranch, the highly-anticipated master planned development under construction in the Bay Area city of Dublin. The neighborhood, “Fielding”, will include 139 two-story, single-family homes ranging in size from 1.8k sf to 2.7k sf. Construction is underway with sales slated to begin in Q2 2016. The overall 184-acre Wallis Ranch master-planned development was acquired by sister company Trumark Communities in 2014 through a partnership with Isles Ranch Partners LLC and Castlelake, L.P. 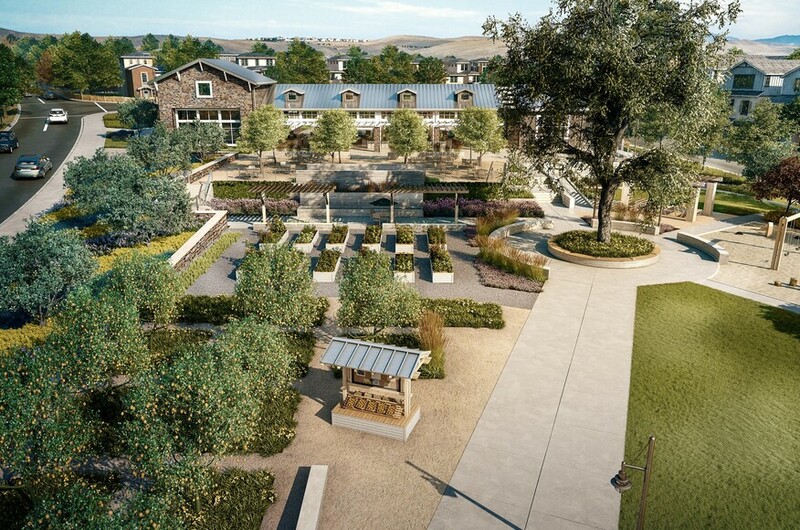 Upon full buildout, Wallis Ranch will deliver more than 800 new homes within eight neighborhoods to a region that has seen a significant boost in housing demand as a result of the thriving San Francisco Bay market located less than 40 miles away. The master plan features single-family detached homes and townhomes designed by local architecture firms KTGY (Oakland) and Dahlin Group Architects (Pleasanton). To create a tranquil enclave that appeals to buyers’ active lifestyles, Trumark Communities dedicated over half of the master plan’s acreage to parks, open space and a water-quality basin. Landscape architects Gates Associates will bring to life a three-acre common area featuring an edible garden, fitness center, pool, spa and BBQ area surrounded by a mile of trail systems. The project will incorporate drought tolerant landscaping that will use all reclaimed water throughout the master plan. Trumark Homes is a visionary, next generation homebuilder with a robust portfolio of master plan communities and new home neighborhoods spanning the state of California. Emphasizing distinction and innovation in every home, Trumark Homes focuses on core infill developments in locations that exhibit strong job growth and provide access to major job centers. The nationally award-winning homebuilder is part of the Trumark Group of Companies, a diversified real estate development and building firm that also includes: Trumark Communities, a residential land development platform; Trumark Commercial, which builds, leases and sells commercial buildings; and Trumark Urban, a vertically integrated residential developer focused on core urban neighborhoods. For more information, visit www.TrumarkHomes.com. GTIS Partners is a global real estate investment firm headquartered in New York with offices in Los Angeles, San Francisco, Atlanta, São Paulo, Brazil, Paris, France, and Munich, Germany. GTIS Partners has 80 employees and currently has approximately $2.9 billion of assets under management. To date, the firm has committed capital to residential, retail, industrial, office, hotel and mixed-use projects in the U.S. and Brazil. In the U.S., GTIS has invested in over 75 projects across 19 states, including 57 projects in the residential sector. In Brazil, GTIS has invested in 90 assets comprised of approximately 13,000 residential units, 530,000 square meters of office and industrial space, and over 9,800 hotel rooms acquired, managed, or under development. By combining hands-on real estate expertise with a disciplined investment approach, GTIS Partners helps create value for its investors and partners. The firm pursues opportunistic real estate investments through direct equity investment and non-traditional lending activities and firm relies on macro-research as well as the hands-on industry knowledge of its experienced investment and asset management teams. For further information, please visit www.gtispartners.com.